Making chapathi is an art but very simple though. It took a little while for me to learn how to make it soft. Lots of trial and error with various combination, finally, here I come with useful tips which I learnt in the process. 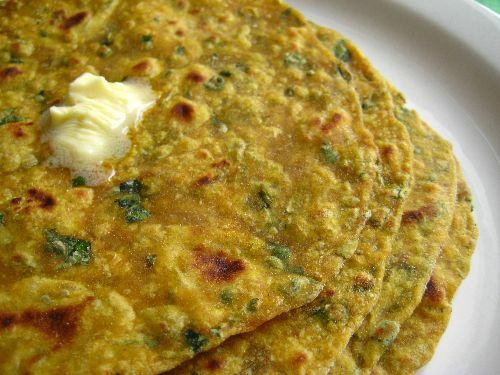 Chapathi is less in calories, so when u want to diet what else could be the best substitute. Chapathi pretty much goes well with any curry or gravy. In a wide open bowl take the wheat flour and salt. Add water little by little and knead it to a soft dough. It would be little sticky, add the extra flour and knead well to a non- sticky flour. Pat the dough with your hands or with the vessel to mix well. Apply the oil on top and knead once more. Refrigerate it for 30 min. Take a small lemon sized flour and make a round shape. Flatten it using ur hands, dust the ball with some extra flour. Place it on the rolling surface, using the chapathi roller spread the flour into a flat thin paper like bread. When rolling, the chapathi should not stick to the rolling floor to get evenly rolled chapathi. So dust with extra flour accordingly. Heat the griddle with medium high heat, place the rolled chapathi. When it small bubbles pop up on top, turn it to the other side. After 20-40 sec, turn back once again. Now the chapathi starts puffing else give it a gentle press with the kitchen towels. Don’t let it for too long on the pan as it tends to become crispy. Add ghee / butter on top of it to keep it soft for longer. 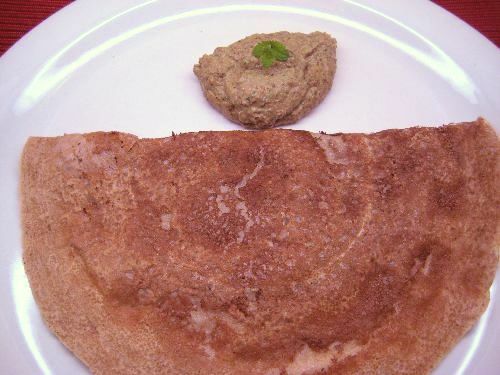 Kneading a soft dough makes the chapathi real soft. Roll the chapathi as even as possible to get it to puff while cooking. Refrigerating helps chapathi to puff. Keep it little above medium high heat to get the chapathi done faster and stay softer. 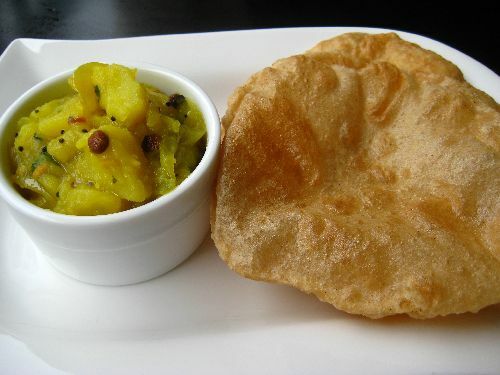 The hot air inside the puffed chapathi is enough to cook them well. 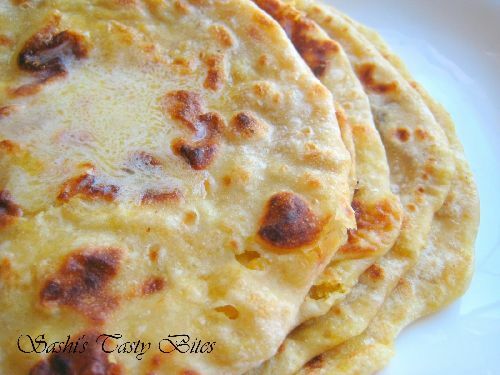 Don’t heat chapathi for more than a min, to get it soft. This way the chapathi’s stays soft for a longer time. After the first turn, chapathi can be cooked by placing directly onto a fire flame for just 2- 5 sec to get it to puff nicely. But care should be taken not to burn ur hands. (*) Any curry cooked with Vegetable or Non- Veg goes good with this. Sashi, I have a question. 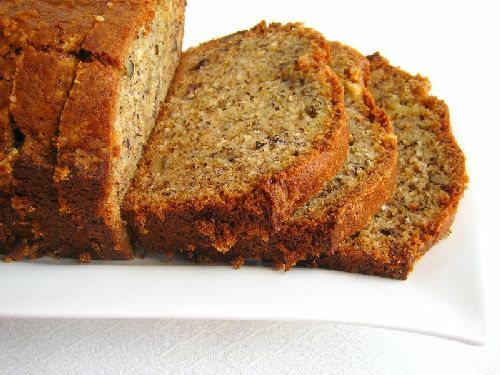 Are you using WHOLE wheat flour? 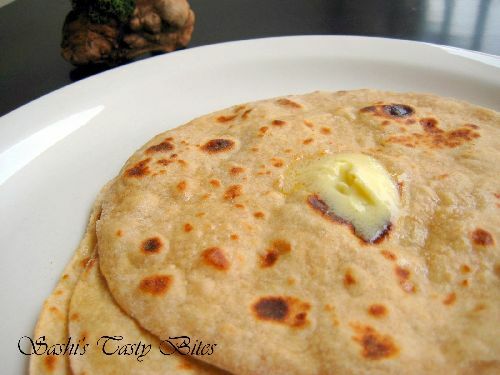 Your chapati looks like what I am used to, white flour tortillas (Mexican). I am experimenting with flatbreads to reduce yeast in our diet and also to learn more about Indian cooking. So far my flatbreads are ok, but crack when i fold them. I have a stove top round griddle that is non-stick and is supposed to only be used on medium heat. Should I use something else that can be hotter? thanks for all the info! Aaran, I used the Whole Wheat flour brought from Indian Groceries. Well, there is not much difference with any other, but mine looks golden brown in color. It’s more or less like a tortilla but made with whole wheat flour. If the rolled flour is cooked for long time on a griddle it becomes hard and cracks when we fold. The griddle which you have should work perfectly fine but spray some oil / butter on top to keep them soft. If you are health consciousness and want to avoid Oil / butter, try making it with aluminum / iron griddle which can be heated to higher temperature, cooks real faster and keep them soft. Also, once cooked if it’s not eaten immediately, we can wrap them ( in batches ) in Aluminum foil to keep them soft for longer time. thank you. I will try your suggestions. i am looking forward to checking out the rest of your site. My husband likes spicy food but I need it very mild. We plan to go to an Indian restaurant nearby soon. They have a buffet, so we can try many different dishes.best wishes! 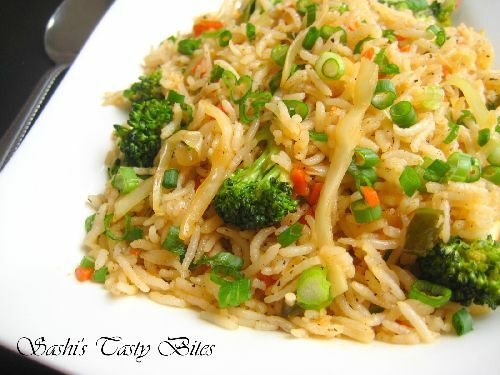 You can find lot of interesting indian recipes here, but reduce the chilies to ur taste. Hope you guys had a great time at Indian buffet. Thank for visiting my blog and leaving ur comment.Ur blog look so beautiful..I like ur template,page element evrything..looks wonderful..Above all your recipes make it fabulous..
You have a wonderful space!!!! Wow Looks so soft and delicious! Pretty, pretty.. loved your pictures. Looks great! Even a very easier option would be to use boiling hot water and little salt right over the flour,knead it with a spoon until its is slightly cool,and then knead with the fingers.None of the other ingredients would be necessary. Thanks dear, tips noted. Will try that out next time and let you know. Refrigerating the dough is an interesting tip. Will give that a try next time. Nice pic. Wow! Soft and gorgeous chapathis!